Treasure Coast Food Bank is the leading hunger relief organization and the only food bank serving Indian River, St. Lucie, Martin and Okeechobee Counties. We currently provide food weekly and other essentials to nearly 100,000 children, seniors, working adults and veterans who don't know where their next meal is coming from. We offer over 20 programs that address the root causes of hunger, providing solutions, healthy food options and road maps to self-sufficiency and long-term food security. For every $1 donated, Treasure Coast Food Bank provides 8 meals and 98 cents of every dollar donated goes directly to serving those in need. For more information, visit our website at www.stophunger.org. Your monthly gift will help Treasure Coast Food Bank continue to provide a reliable, steady source of food and other essentials for nearly 100,000 people struggling with hunger on the Treasure Coast. These are our neighbors – children, seniors and families. One donation a month adds up to a world of difference. 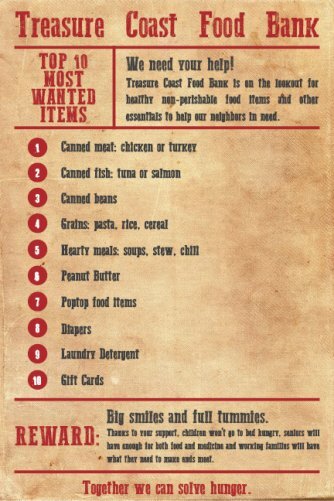 For every $10 donated, Treasure Coast Food Bank can provide 80 meals. Here’s the difference you can make in just one year: $10 provides 80 meals, $25 helps provide food boxes to seniors, $50 feeds a family of four for a month, $100 can provide food filled backpacks for children on weekends. Volunteers and donations are invaluable to Community Service and Operations of the Treasure Coast Food Bank. Join the mission to alleviate hunger on the Treasure Coast by making a donation, becoming a monthly donor, hosting a food drive or volunteering your time at the Food Bank.